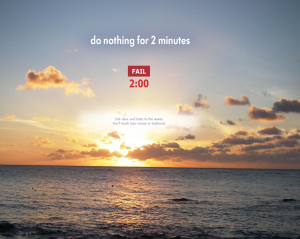 Can you do nothing for 2 minutes? This website challenges you to give it a try – literally! Just go to the website, look at the picture of a beautiful sunset and listen to the relaxing waves. There is only one rule, which is not to do anything for 2 minutes, if you can. This can be a cool tool to be used after a stirring activity in the classroom. It can be a great transition for a settle down activity in the classroom.Can you or your students beat it?? If you like this tool, here is a cool tool where you can listen to the natural sound of a light or a heavy rain. You can even make music with it. Enjoy these two websites with your students and have a relaxing weekend all!